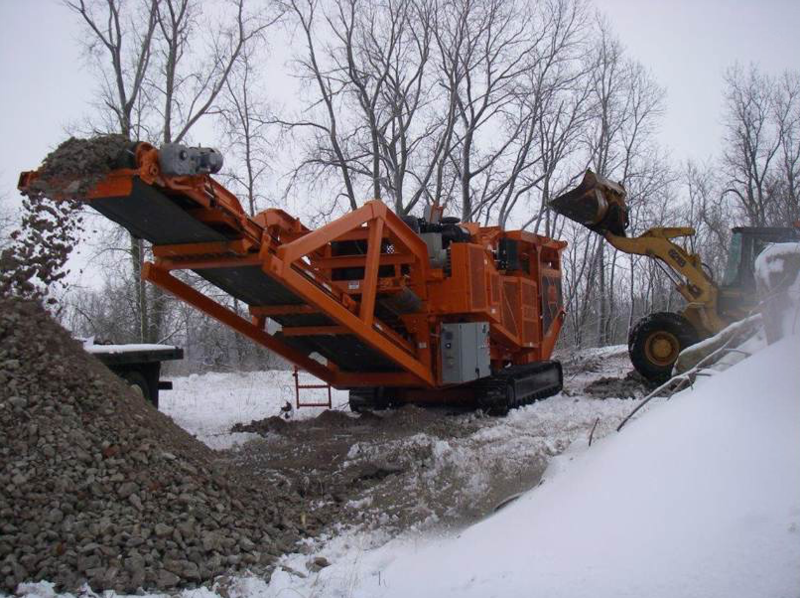 In these pictures, a loader feeds material from the recycle pile for crushing in the Eagle Crusher UltraTraxx®, but only after the team has followed the steps for best cold-weather work. Photos courtesy Eagle Crusher, Galion, Ohio. During the off-season, one of the best uses of your “down time” is to crush recycle piles and prepare for spring startup. Be aware though, not all goes smoothly when cold temperatures get at the inner workings of equipment. With cold weather as part of the equation, it’s important to make sure you’re ready to continue operating in cold temperatures. 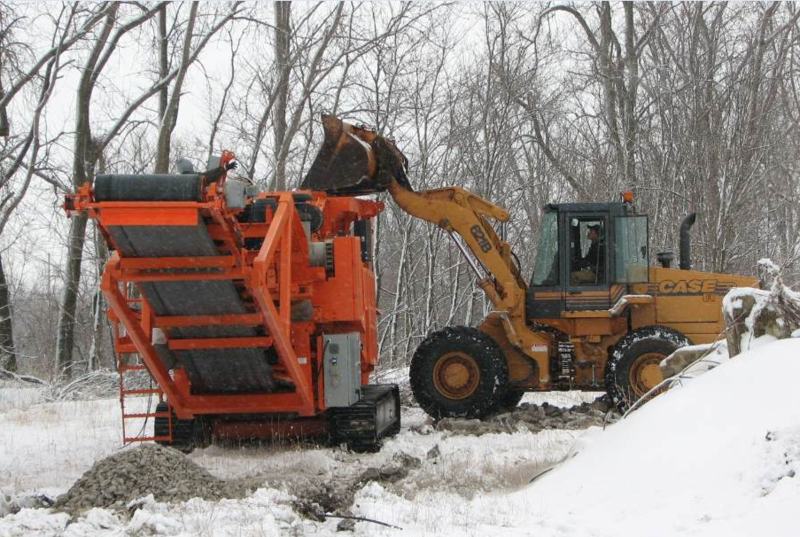 A few helpful tips will keep not only your crusher, but also other heavy equipment running when the temperature drops. Cold weather means the possibility of diesel fuel gelling. Diesel that has gelled can prevent the engine from starting, or can cause it to shut down mid-operation. Make sure that glow plugs are functioning and that your fuel filter is clear. If temperatures are very cold, make sure your fuel is warm enough to reduce gelling. Because diesel engines need to be warm to induce combustion, install a block heater and cover the radiator fan when temperatures dip. Make sure your coolant, oil and fuel mixes are temperature-appropriate. Many fluids have specific operating temperature ranges, so it’s important to make sure your fluids will continue to perform in the cold. When starting equipment in the cold, make sure to give the engine time to warm up before operating the equipment. While you should always conduct a visual inspection prior to starting up, it’s especially important in cold weather. Look for anything broken, cracked or missing. When temperatures fluctuate above and below freezing frequently, water can leak into spaces and constant refreezing can cause premature failure, or cause parts to break. Make sure your batteries are fully charged. It takes more amps to turn an engine over in the cold. If a battery is nearing the end of its useful life, replace it. If possible, install a battery warmer. If shutting down for an extended period, it may be appropriate to remove the battery and store it indoors. As always, it is important to review the operator’s manual for each piece of equipment you operate so you’re aware of any equipment-specific tips for cold-weather operation. Bill Compton is the service manager at Eagle Crusher, Galion, Ohio. For more information, visit www.EagleCrusher.com, or contact Bill at (419) 468-2288.